Our Call for Proposals has ended. Thank you to everyone who submitted a proposal. You will be notified of your status in March. 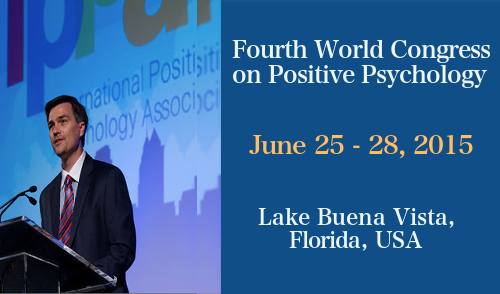 The Fourth World Congress will highlight the strongest and latest work in positive psychology research and practice from around the globe. We hope you will join us. Below you will find additional information about the abstract submission process, best practices for proposals, and other common questions. If we can help clarify anything else, please contact us. Our call for proposals is hosted on a platform called Submittable and can be found here or by clicking the submission button at the top of this page. All submissions must be received by January 31, 2015. Regardless of your IPPA membership status, all prospective presenters will need to create a free Submittable account to access the submission forms. This will help us organize the abstracts and keep you informed of our progress during each step of the the review. Notifications about your abstracts will be sent from info@ippanetwork.org, so please be sure we are on your approved sender list or check your spam folders if needed. For more detailed instructions for each category, please click one of the links above to visit the submission site and preview the forms. In particular, if you plan to submit a proposal for an organized symposium, please note that one person on the proposed panel will be responsible for gathering all of the requested presenter and abstract information and submitting it together. To reduce the risk of unintended formatting errors, we recommend writing and saving your proposal information in a text file (.txt format) before pasting it into the submission form. You will receive a confirmation email once your proposal has been received. Once the call for proposals has been closed, each submission will be assigned for review by either our Science Committee or our Practice Committee. Each of these committees comprises a team of volunteer reviewers who will evaluate the quality of each proposal and make recommendations for consideration for acceptance. We would like to thank Lea Waters, Ph.D., and Shannon Polly, MAPP, for chairing the Science Committee and the Practice Committee, respectively. Each submission will be evaluated independently by at least two reviewers before moving on to the Committee Chairs. In consultation with the Congress Chair, Kim Cameron, and the IPPA Executive Committee, the Committee Chairs will determine the number of available program times and select the mix of proposals that offers the most compelling new insights into the science or practice of positive psychology. Particular attention will be paid to opportunities to showcase outstanding work in a wide range of international locations. The intended timeframe for notification of programming decisions is early March 2015. We will notify all prospective candidates of a more specific timeframe as soon as we are able. While all presenters must have an active IPPA membership (Member, Associate, Student, or Affiliate) at the time of the Fourth World Congress on Positive Psychology, there are no restrictions who can submit a proposal. All submitters are asked to provide a brief summary of work and education experience to provide the review committees with an understanding of your qualifications to present on your proposed topic. Once notifications have been sent in early March 2015 (see below for details), accepted presenters will be asked to verify that they have a current IPPA membership. Yes, although each submission should have a unique point of emphasis. Please do not submit the same proposal to multiple categories; instead, think carefully about what session type best suits your proposed presentation. If the review committees have questions about your proposed session type (e.g., if your proposal is not accepted for an Individual Presentation but is considered to be a strong candidate for a Poster presentation), the IPPA Team will contact you with a request for more information. Once you create an account on our abstract management site (Submittable), you can manage and make changes to your draft submissions until your abstract is marked complete. If you have any questions during this process, please contact us. Final decisions are expected in early March 2015. Once a more specific date is known, the review committees will notify all candidates by email. No. In order to offer the diversity of programming we hope to offer while still keeping costs manageable, especially for students, we are not able to waive registration fees for accepted presenters. Once acceptance notifications have been sent, we kindly request all presenters to register for the World Congress within one month in order to confirm their placement in the final program. Will my abstract or presentation be published? Accepted abstracts will be printed in the final program, which will be made publicly available both on-site and online. Accepted presenters also will be asked if they would be willing to share their slides and/or a recording of their session (where available) with the IPPA Learning Library, our growing educational resource hub for information about positive psychology. Symposia are 60-minute presentations by 3-5 individuals who address a common theme or topic in positive psychology. Ten minutes should be reserved for questions from the audience. Proposals that include participants from more than one nation will be given preference. Symposium submissions should include a 200-word general abstract and an indication of the general topic (see below) to assist the Committee in choosing an appropriately diverse set of topics. Submissions should also include a 200-word abstract for each participant’s presentation as well as a brief summary (no more than 200 words) of his or her education and work experience. Individuals with presentations that are not being submitted as part of an Organized Symposium can submit a proposal for a 10-to-15 minute Individual Presentation. The review committee will group 3-5 selected Individual Presentations into a symposium, complete with 10 minutes reserved for questions from the audience. Individual Presentation submissions should include a 200-word general abstract and an indication of the general topic to assist the committee in choosing an appropriately diverse set of topics. Submissions should also include a 200-word abstract for the presentation as well as a brief summary (no more than 200 words) of the presenter’s education and work experience. Workshops are 60-minute, small-group interactive sessions that focus on either a specific positive psychology intervention or assessment or a research method or approach. Workshop submissions should include a brief summary (no more than 200 words) of the education and work experience of the workshop leader(s), a 200-word abstract, and an indication of the general topic (see below) to assist the Committee in choosing an appropriately diverse set of topics. Proposals for applied workshops that are not reporting original research should include an additional 200-word explanation showing how the workshop is based on specific empirical research in the field. A Conversation Hour (60 minutes) is a relatively informal round-table event intended to stimulate discussion on a specific topic. It should include several presenters with different points of view (mini-debate) and a moderator with an established reputation in the area who is responsible for directing the conversation and for keeping the session on schedule. The session may be supplemented with handouts provided by the presenter but should not involve Power Point slides. Submissions should include a brief summary (no more than 200 words) of the leader’s education and work experience, a 200-word abstract, and a description of its general topic to assist the Committee in choosing an appropriately diverse set of topics. Poster submissions should include a brief summary (no more than 200 words) of the presenter’s education and work experience, a 200-word abstract, and a description of its general topic (see below) to assist the Committee in choosing an appropriately diverse set of topics. Submissions presenting research should be formatted to include the following elements: Background, Methods, Results, Conclusions.